The proceedings of the Finnish Operations Research Society 40th Anniversary Workshop is available on-line for full pdf download. The proceedings includes some real options papers as well. Being an academic, I am always wishing for free tools for my students and for myself to do my work and while searching for them I found a simple Monte Carlo add-on for Excel, built by colleagues from Wabash College. The tool with instructions for installation can be found here. I wanted to test this tool and compare it (and Monte Carlo simulation in general) with the approach that the pay-off method uses in creating the pay-off distribution. Below I have included a full illustration of what I did with Excel screenshots of “everything”. I “generated” the Excel sheet by just inventing numbers for a fictitious investment that has an uncertain discount rate, uncertain cost that happens in year zero and with revenues that accrue during five years. For the pay-off method I used three scenarios minimum possible, best guess, and maximum possible. The numbers… came out of the proverbial hat. Costs and revenues are unrelated here – incidently this, i.e. unrelatedness, is also a requirement, when correctly using the Monte Carlo simulation that is based on randomness. This also means that minimum cost can occur with maximum revenue and vice versa. Screenshot from the Excel sheet is visible below; even more information about the calculation is included in the screenshot. Below you will see the resulting pay-off distribution that has the top over 148 and min at -69 and max at +501. Now with the Monte Carlo tool I used the same input information, but one major thing is different. The RAND() function that Excel uses and that is used by the MC simulator can only draw from an interval and hence will not consider the information about the best guess that we have available. Input parameters to the tool are 100000 (one hundred thousand) runs and seed 123 (in case you want to retry this illustration – the results should come out exactly the same, if you input the same seed). With my oldish laptop it took about 30 seconds to run the simulation, this is quite acceptable for free software. I personally remember way back when running this kind of simulation took two hours. Without using the seed it runs faster. The setup of the spreadsheet is a bit different as we are not calculating the values for the pay-off distribution for the three scenarios separately, but we are just giving the simulator “orders” to randomly generate the result for cells. For each cell of “PV cost” and “PV revenue” the Excel has been instructed to generate a random number from between the min and the max value. The “PV project” row is just the revenue minus the cost, and “NPV project” is just “PV project” cells summed up. The discount rates had also to be changed and given as integers. [A related observation: there is also a function called RANDBETWEEN that allows for us to directly specify the interval – this however is not supported by the free simulator software]. Running this sheet (randomization) one hundred thousand times results in a pay-off distribution below – now observe that this is NOT a fuzzy number, but the Monte Carlo simulation hails from a different domain, that of the true randomness – so this is a probability distribution for the NPV.The top is above 307, min value is -8 and max is 598. We also get standard deviation information from the MC tool – standard deviation is 91. Building the Monte Carlo model took me more time than using the simple way that is the pay-off method – I think as I am not very accustomed in using the add-on it took more than it would if I used it a lot. However, still building the spreadsheets without having to do any “programming” or using more complex formulas is faster. Once the spreadsheet is ready it is very easy to change parameters and run the simulator. For a simple “quick and dirty” analysis I think that this simple experiment with the Monte Carlo simulation did not provide the kind of “bang” as the atom bomb for the construction of which it was originally built to be an aide. If we had not had the best guess scenario information the info provided by the MC would outweigh just “interval information” for sure! Maybe you have noticed that I have tried to steer clear of any strong opinions on which of the two methods is better – IMO both are good and both have their own uses. The methods themselves are not an issue – the available information and the fit of the information to the method is the issue. Also available time to perform analysis and transparency are issues that one wants to think about. If you want to try this yourself download here the spreadsheet file used in this illustration. Remember that you cannot run the simulations unless you have the software installed (link to the add-on here). A workshop on strategic real options was held in Bremen, Germany on the 18th of October at the University of Bremen. The full presentation slides in pdf and information about the workshop are available through this link. The site was down for a few hours after I experienced unexpected problems with upgrading the background system. Now everything should be up and running again! After these technical difficulties are now hopefully resolved for good, I want to take this opportunity to thank everyone who has visited the site during 2012! All together there were over 2000 visits to the site from 89 countries in 2012. This is an increase from 2011. The FORS40 workshop is organized to celebrate the 40 years of the Finnish Operations Research Society (FORS) and it brings together the Finnish operational research community with international participants. The FORS40 workshop takes place at Lappeenranta University of Technology, situated in South-Eastern Finland and located on the lake Saimaa. Working language of the conference is English. FORS40 Workshop website can be found from here. The workshop is held on August 20th and 21st, 2013 in Lappeenranta FINLAND, at Lappeenranta University of Technology. A connected doctoral consortium takes place on August 19th, 2013. Workshop theme is “Optimization and Decision-Making”. Both, theoretical and application-oriented papers are welcome within the scope of the workshop theme. Download the Call For Papers from this link! The version of the book now available on-line already includes the change. The pay-off method is presented in a joint research workshop of the University of Bremen and the Lappeenranta University of Technology in Bremen, October 18th of this year. The workshop is titled” Workshop on: Strategic Real Options -Concepts, Theories, Applications” and it is chaired by Prof. Jörg Freiling (U. Bremen). As far as I understand the workshop is free for everyone to participate, so welcome if you are in the Bremen area! See the workshop flyer below for further information about the registration. Teeing off is the moment of truth, the unskilled player feels an itch as he is not exactly sure which club to choose for the distance, or where the ball will land, left or right. His cone of uncertainty, the projection of possible paths is wide and long. The skilled player feels confident, he knows that the right club for the 146 meter par 3 is the 8-iron and that with his skill he will be able to land “close to the green”, not too much wide on either side. The cone of uncertainty is narrow and not so long. This is actually a strikingly good analogy for comparing the unskilled and skilled business analyst; the unskilled analyst knows much less about the business or the markets and is less good at estimating the future, based on his knowledge and skill. When “the event” will take place is also less precise. The cone of uncertainty of the unskilled analyst is wide and long, while the skilled analyst knows more and is likely to be better with both, timing and accuracy. BUT just like with golf, even the most skilled make mistakes. Many have seen golf pros shoot to the crowds, even in the majors or make some other unfathomable errors in judgment – the expectation of high accuracy make “off-the-charts” or in this case “off-the-cone” mistakes spectacular (failures). Nobody is surprised if the unskilled player makes a mistake, as it falls within the expectations. 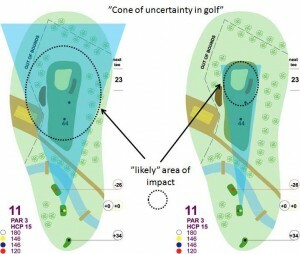 ALSO even the golf pro knows that he may end up in the bunker within the “likely area of impact” – the difference with the pro and diletante is that there is only one bunker in the pro’s likely area of impact, but there are many hazards in the diletante’s likely impact area. Also the pro knows how to get out of the bunker. The know-how, the skill, and the experience of tens of thousands of repeated shots and played courses the pro golfer has is vested in him personally – it is “normative” – exactly like analysis skill that the expert analyst has acquired; the pro’s skill does not help the next guy’s game (unless he gives tips). Fair enough, usually there are tips to help us! We may have tools that help us a long way – by this I mean that we may have been able to codify the pro’s knowledge in a system or within a method. 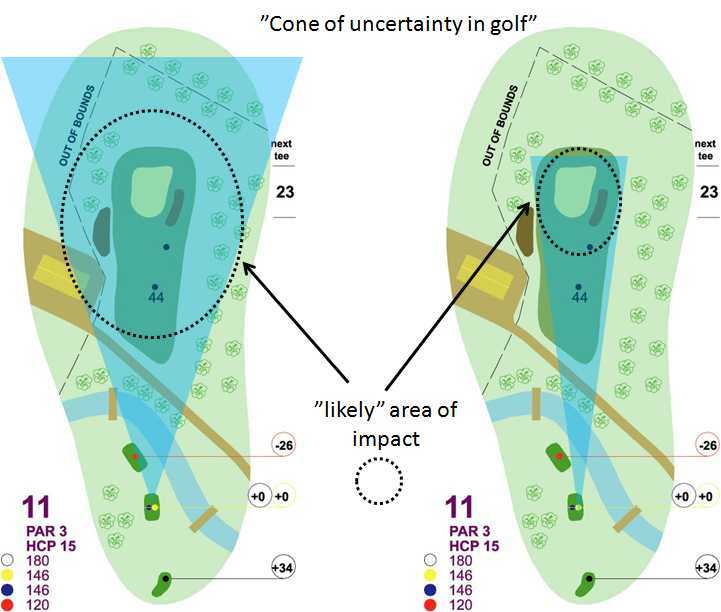 The big issue is, if we fully understand the context; if the method is the 8-iron for the 146 meter par 3 tee-shot, then is it also the right method for a 460 meter par 5 tee-shot? Most likely it is not; that’s where being a real pro comes in – the selection of the right club for the shot is key in playing good golf. Horses for courses… not one club for all shots, not one rigid method for all situations! ALSO, sometimes it makes sense to make the decision to make two “sure” shots rather than one really risky one. The expectation is better; call it staged investment if you like, anyway, we surely are in real options territory! The organizations with the most skilled business analysts are likely to fare better, because they have a narrower cone of uncertainty (ability to analyze markets) and thus a lower level of risk – even in risky markets. We sometimes call this tacit knowledge, and surely it exists, even if it is sometimes hard to put a finger on it. Similarly a pro golfer will do better in a new course than the diletante; experience is key as long as the game rules stay the same. Then there is the “hero golfer” who is a blind believer in his skills and choice of club (whatever the actual skill level), he is blind to the cone-of-uncertainty. There is only one outcome, that is the perfect shot, the hole in one. 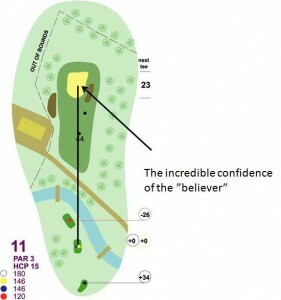 The hero golfer is an analogy of the analyst that gives his expectation of the future as a single number. He oozes certainty that his estimate of the event timing is spot on and there is no width in the cone, indeed his NPV is a hole in one. I don’t have the confidence of the “hero golfer”, so I like to present my expectations of the NPV as a pay-off distribution. It seems that golf is an endless source of analogies for business, but it is good also for something else; nothing makes a man humble like golf – all mistakes are your own and you cannot blame anyone else for them. Anything that reminds us of our fallibility has got to be good – at the end of the day errare humanum est. New book on the pay-off method out! 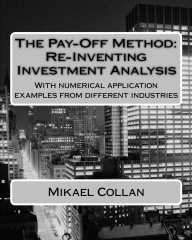 A new book on the pay-off method by Mikael Collan called: “The Pay-Off Method: Re-Inventing Investment Analysis – With numerical application examples from different industries.” is out and available at the CreateSpace on-line store ! The book will be soon be available also on Amazon.com and Amazon’s European on-line book stores. This is the first book published on the pay-off method and on how it can be used in supporting investment decision-making. It is a managerial book that is good for teaching purposes as well. It is not an academically written work. “Businesses and managers everywhere are finding out that using the classical investment analysis methods is not enough to cover their need for smart decision-support for high risk, hard to estimate investments under vague information, such as investments into R&D, IPR, and any other strategic projects and assets. This book introduces the pay-off method and shows how the method can enhance investment analysis and decision-support in a profound way. The pay-off method and a selection of tools within the pay-off method arsenal, including real option valuation, are simple to use, transparent, no-nonsense, and intuitive to understand. This book explains the pay-off method in detail and shows with many numerical easy-to-follow examples how the method can be applied in real-world decision-making in different industries. This book shows also how decision-making can be enhanced by visualizing imprecision and how real option valuation can be performed simply. All method presented are easily implementable with the most commonly used spread-sheet software.